If the walls of the home you just bought are covered layers of wallpaper that date back decades, it may be time to strip it all and start anew. Stripping wallpaper, as anyone who has done it can attest to, is not an easy task. It requires a great deal of effort and is labor intensive. The tips and tricks below cannot make the job a simple one, but they can help you tackle the project in record time. Before purchasing wallpaper remover or any type of adhesive breakdown compound, inspect the wallpaper in the room. If it is peeling, you have the advantage of being able to peel back the first, and possibly, the second layers to see what is beneath. This will give you a good idea of the amount of work that is going to be required for the job. If there are three or more layers of wallpaper and the wall underneath is plaster, you will have to use more care than if there was only one, very loose wallpaper layer atop drywall. By investigating what you will be working with before you begin, you can head to the home improvement store with a good idea of what you will need to complete the project. There is a very useful tool in wallpaper removal called a scorer. It is a small hand-held instrument that has rows of small teeth. When it is rubbed over the wallpaper, it creates tiny holes and breaks in the wallpaper surface. This is especially useful when you apply the wallpaper remover, because it allows it to penetrate to the wall surface below. Scoring tools are available at all paint and home improvement stores and can usually be found in the paint or wallpaper areas. After the wall has been inspected and scored, use a commercial wallpaper remover to loosen it from the wall. There are many different chemical removers available that are usually effective, but they come with a combination of high odor output and highly irritating chemical compounds. For a more eco-friendly approach, try steam to remove the wallpaper from the wall. A steamer can be rented or purchased for the project and it provides an environmentally safe method for effective wallpaper removal. The steam actually penetrates below the surface of the wallpaper and loosens the adhesive compounds. If there are many layers of wallpaper, it may take a few applications of steam as you remove the wallpaper layer by layer. You will find that once the wallpaper is removed, the wall that you had plans to immediately paint is not fit for even a coat of primer. Typically, you will find years’ worth of wallpaper adhesive cemented to the surface, and a good amount of scraping will be required to remove the last vestiges of lingering wallpaper. 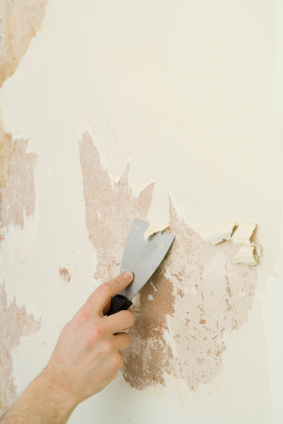 Chances are that you will need to patch the wall with compound and sand it out to a smooth surface. If the wall is in such bad shape that it cannot be patched, removing it and hanging new drywall may be the next best option. Always allow extra time for a wallpaper removal project. Wallpaper is one of the rare materials that can linger on a wall no matter how hard you try to remove it. If, after removing all that you can, and the wall is simply not in any shape to be painted, you may want to consider re-papering it with a pattern and color that is to your liking.